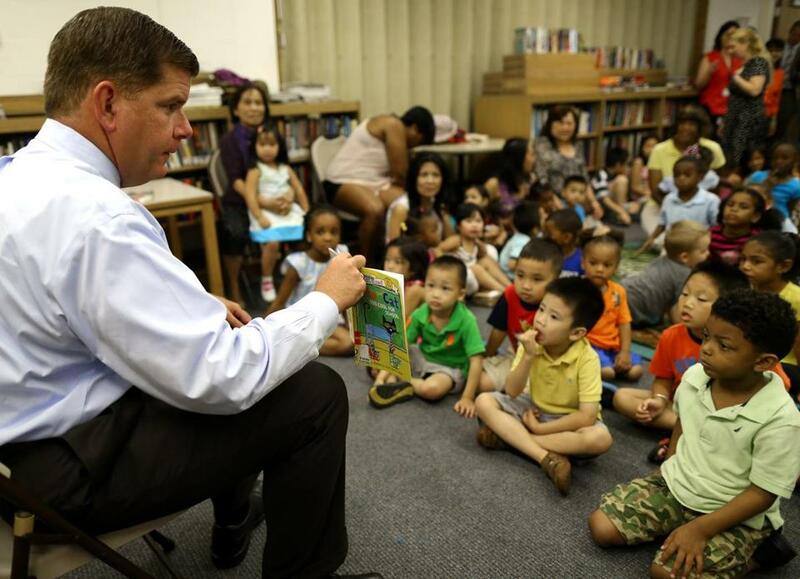 Mayor Martin Walsh, reading at a Boston library in Fields Corner, has not released findings from an early learning group. In the two years since Boston and New York elected new mayors with a common campaign pledge of dramatically expanding preschool, the cities have operated at drastically different paces. New York delivered universal preschool in September, getting nearly 50,000 more children enrolled. Every 4-year-old who signed up got into a classroom somewhere in the city. In Boston — where Mayor Martin J. Walsh said he would double the number of preschoolers within four years — the city still doesn’t have a plan to make that happen. Instead, he has offered only enough new funding to add 200 preschool seats and has relied upon a federal grant that brought Boston Public Schools’ preschool model into private centers across the city — all told, boosting the preschool rolls about 5 percent. Over a year ago, an advisory committee of experts empaneled by Walsh submitted its recommendations on how to create a universal program, but the mayor would not release its findings to the Globe, saying the city has no means of paying for it. Making quality, full-day preschool available to all the city’s 4-year-olds could cost $56 million, the mayor said. Even more daunting, city schools don’t have the capacity to handle all those children, and Boston might need to renovate many school buildings and partner with existing day-care centers to accommodate them. The impatience is coming even from within: The Boston Teachers Union is poised to reveal a proposal to launch universal full-day preschool for all 4-year-olds in the Boston Public Schools. Nationally, Boston Public Schools had been a leader in providing early education, with Mayor Thomas M. Menino making strides toward educating 3- and 4-year-olds a decade ago. But intentions have been grand and delivery incremental. Menino had promised to provide universal preschool by 2010. Five years later, Boston Public Schools provides 2,467 preschool seats — enough space for less than half of the 6,000 4-year-olds in the city. A lottery determines which families get those full-day spots. At private day-care centers, similar care costs working parents $10,000 to $16,000 a year. As he noted, early childhood research shows that programs with trained teachers and small teacher-to-child ratios can eventually yield benefits through better standardized test performances, academic achievement, behavior, and labor market success and decreased crime and delinquency. “Boston cannot leave to chance which students have access to early childhood programs,” Walsh wrote. Mayor Bill de Blasio of New York raised even more ambitious goals during his 2013 campaign, wrapping his universal preschool plan into his platform of stemming inequality. Though Governor Andrew Cuomo blocked de Blasio’s efforts to pay for preschool with a tax on the rich, the state still provided most of the new funding: $300 million each year. Over two years, New York City boosted its preschool enrollment by nearly 50,000 children. The city now educates 68,547 4-year-olds in city schools as well as private day-care centers that partnered with the city. That’s still under 60 percent of the city’s 4-year-olds — estimated at 115,938 — but the city was able to offer a seat to any family that wanted one. 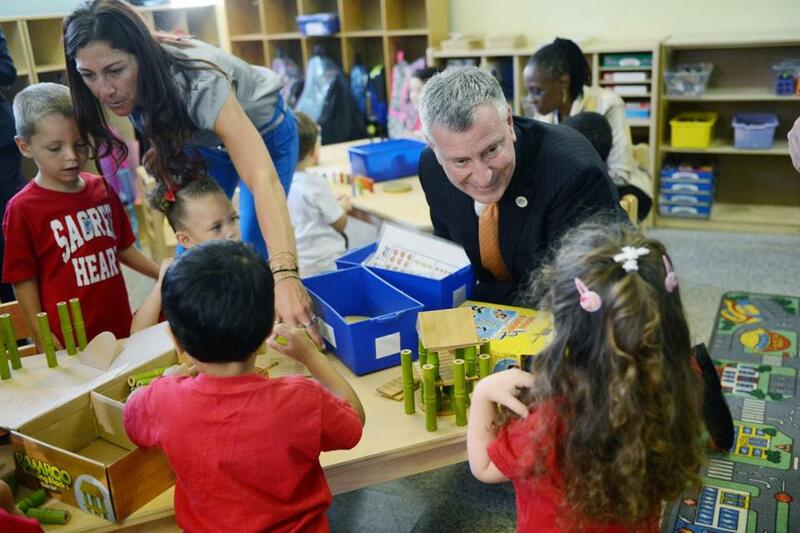 Mayor Bill de Blasio, visiting a class on Staten Island, N.Y., added 50,000 children to the pre-kindergarten program. New York relied on partnerships with nonprofits and private preschools to offer universal coverage. Funding went to boost private teachers’ salaries and recruit professionals to do a job on par with public school teachers, whose pay is set by a union contract. Early education teachers typically receive very low pay, and swift turnover can diminish quality, eroding the educational benefits schools hope to offer. In Boston, Walsh promised as a candidate to double the number of full-day preschool seats for 4-year-olds within four years. With 2,388 4-year-olds in city schools that year, the goal would be 4,776. He even floated the idea of selling City Hall for redevelopment to fund universal preschool. But as mayor, he frowns upon that notion, telling the Globe this month that the one-time revenue was unsustainable in the long run. Instead, he suggested the effort should be funded by the state and noted that de Blasio expanded his city’s preschool almost entirely through new state funding. However, Walsh acknowledged that he has not yet broached the subject with Republican Governor Charlie Baker, who has expressed doubts about the durability of the benefits of early education and whose administration is already hinting it will be forced to make tough choices to balance next year’s budget. Asked about the likelihood that the state would pay for a Boston preschool expansion, Baker’s education secretary, James Peyser, pointed to the support the state already offers. “Despite a billion-dollar deficit, the Baker-Polito administration boosted funding for education, including early education and care,” he said in a statement. In contrast with the Boston Teachers’ Union proposal — which would educate all city 4-year-olds in the public schools — the mayor expects Boston to team up with community-based organizations, as New York did. Boston Public Schools have been experimenting with such teamwork for the past three years, using private foundation money and federal grants to help nonprofit preschools improve quality through a program called K1DS. Much of the funding went to boost teachers’ pay. In preschool classrooms at Ellis Memorial, a South End nonprofit, that meant four teachers got a pay hike from $32,000 to roughly $43,000. When that funding ended this year, another short-term federal grant filled the gap. The mayor could not articulate a plan for how to pay for such partnerships after the federal grant money dries up. But he suggested that Boston’s slower approach will be informed by its experience. Walsh declined to release the findings of the Universal Pre-Kindergarten Advisory Committee he formed in May 2014. The 27-member panel was created to study factors including class space requirements, teacher qualifications, and potential partnerships. Still, Boston’s director of early childhood education defended the schools’ progress compared with New York.